Mitt Romney's not going to let Jon Huntsman's CelebriGum challenge go unanswered. As explained in the previous entry, Governor Huntsman skipped Iowa in order to concentrate on his CelebriGum appearance. But with a net worth of approximately $200 million, Governor Romney has the resources to compete both in Iowa and on CelebriGum. And as you can see, Mitt takes impressive gum photos. The sober blue "I'm in charge" tie. The crisply parted hair. The glowing white shirt. Even the hint of gum-like gray at the temples. And the classic campaign trail handshake. But there's something more. An odd detail with a subliminal message. That's a $5 New York Lottery scratch-off game called "$1,000,000 Winfall." Romney = 12 chances to win up to a million dollars? Wow, this guy is a genius. You know your life is going well when you can afford the $5 scratch offs. If you squint at the handshake photo, it looks like the gum is holding the lottery ticket. Coincidentally, Mitt has a brother named Squint. 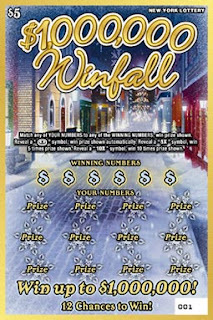 Oh, and more subliminal genius: Winfall = win in the fall? Whatever Mitt's not smoking, I want to not smoke some! If elected, I wonder if gum lobbyists will try to convince Mitt to change his name to "Mint."